Number 3 "It has begun with a camp fire ! ----- Application of thermoelectricity to electric generation"
In this story, I compared early applications of thermoelectric generation with those of quite recent days. There is thirteen years of time gap between the discovery of Seebeck effect in 1821 and the discovery of Peltier effect in 1834. This may have affected for the resulting very many trials of thermoelectric generation in the dawn era of thermoelectricity. The development of practical device and equipment for thermoelectric generation mainly carried out in Soviet Union since A.I.Ioffe, a Russian physicist, for the first time, theoretically explained in a book in 1929 that semiconductor thermoelectric material has high thermoelectric performance. The book, "Semiconductor Thermoelectric Cooling" is called "The Bible of Thermoelectric Semiconductor". Even if you used semiconductor materials Dr. Ioffe indicated, you could only get efficiency of 2 to 4 %, however, compared to the conventional metallic material's efficiency of below 0.1%, the theory was epoch-making ! See Figure 1. The equipment beside a fire cooking something with an odd-shaped pot is a wireless communication gear. At the bottom of the pot, thermoelectric element couples made of zinc antimony(ZnSb composite semiconductor) and constantan(CuNi alloy) are installed. The pot was called "Partisan's canteen" that were used at the World War II(Russo-German War) in Soviet Union at around 1940. A canteen may not be popular for everyone, it is a portable cooking pot usually used by soldiers or campers in the outdoors. The pot in the illustration is much like home cooking one, a bit different from a typical curved canteen. The temperature at the bottom of the pot scorched by fire could have reached to several hundred degrees centigrade, while the temperature of the content of the pot should have been around 100°C, the temperature difference possibly was kept above 200°C. 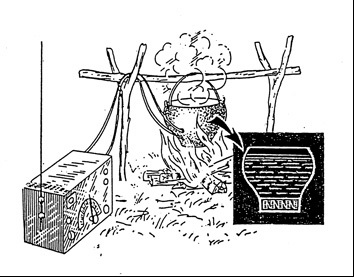 To call this system "a thermoelectric generation" sounds a bit exaggerated, it rather appropriately be called "a campfire electric generation". Any way, this can truly be admitted the very first practical beginning of thermoelectric generation. 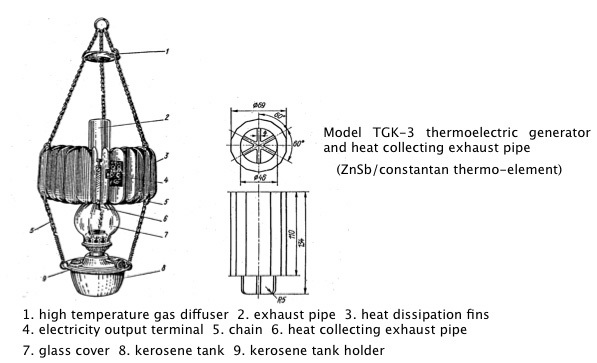 Fig.2 shows a home kerosene lamp having exhaust-gas pipe(right side illustration), installed with ZnSb/constantan thermoelectric elements, is attached to the upper part of the lamp where combustion exhaust gas is going out. Large cooling fins are fit to this exhaust pipe so that a temperature difference is given to the thermo-elements to generate electricity. I incidentally have seen this type of lamp like in Fig.2 in the showcase of Leonardo da Vinci Museum in Milan, Italy. 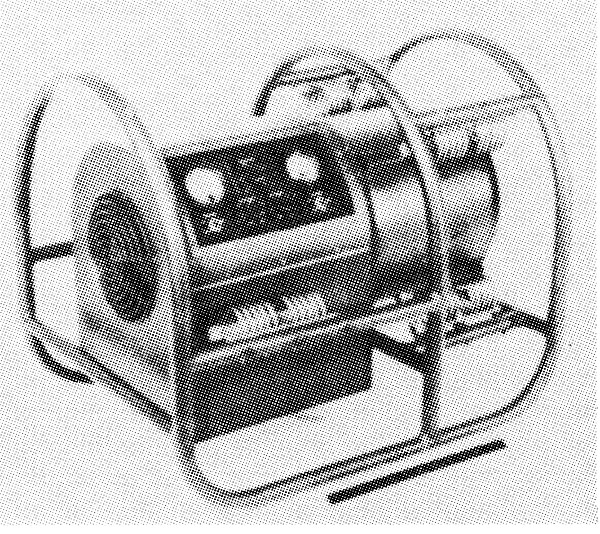 In 1970s, about 30years later since the practical use of thermo-electric generation in Soviet Union, a thermo-electric generator such as shown in Fig. 3 was deployed as a battery charger for the United States Army. This generator, could be operated with gasoline, jet fuel and diesel fuel, had an efficiency of 3%. Previously mentioned " camp- fire generator should have had much lower efficiency. 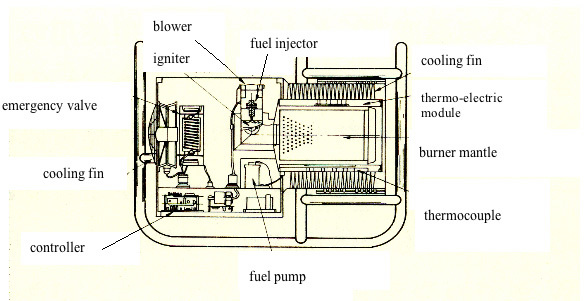 In the structure of the generator in Fig.3, there were a lot of ideas in fuel injector, fan and burner mantle to efficiently burn fuel and effectively transmit heat to the thermo-elements. As a result, it relatively had a high efficiency. This generator obviously had advantages with the noise level of one fifth of a gasoline engine generator and with no maintenance for 1500 hours. It looks, however, that "campfire generator", should it work well, may be much better for a guerilla war than the modern one. How about to refine "camp fire generator" to a modernized one ? 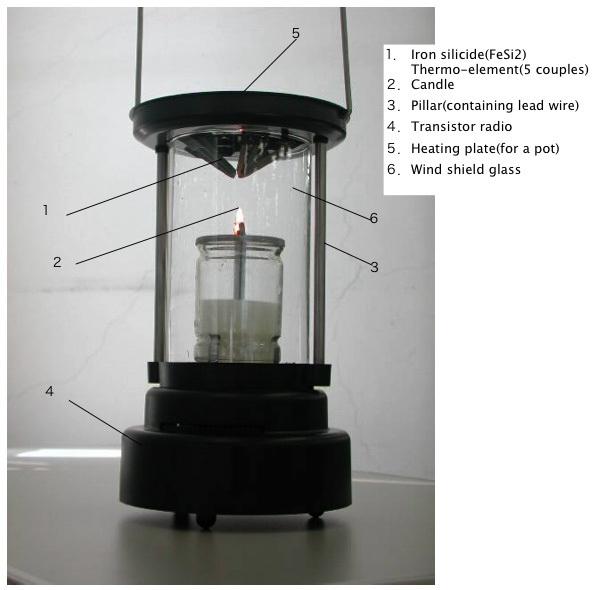 Fig.4 shows "candle radio" sold around 1990, using iron silicide (FeSi2) thermo-elements produced at KELK Ltd. This product is undoubtedly an application of thermoelectric generation, but it features a kind of amusement rather than usefulness. Compared to the previously mentioned "lamp generator", a difference of the necessity of the two products, which come from the background of the era and the technological infrastructure, can be clearly found. Although the product in Fig.4 is almost a hobby, local government such as city of Tokyo bought some for test use in the preparation for a Tokai Great Earthquake expected to occur at that time. 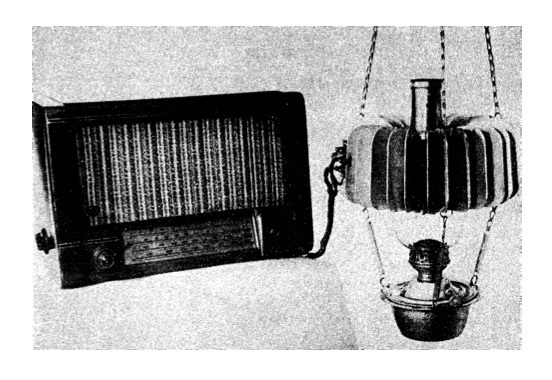 I have tried to hear the "candle radio" and found I really could hear NHK program only if I were near the window in our building. But I didn't try to make a coffee.